The Mews is a spacious open-plan, ground floor apartment with high ceilings and wooden sash windows, divided in part by the original polished wooden partitions which formerly accommodated horses. Fully equipped kitchen, dining table and sitting area with an excellent wood burner (wood supplied free from the estate). A glass door leads to a spacious sunny, south-facing, enclosed garden with sea views between the leaves. The King size bed and dressing area are concealed behind a low paneled wall. The large shower-room has a new shower, installed spring 2016 (1200x900mm, with a 4"step) toilet, basin and heated towel rail. Other detail - quality linen & duvets. Digital TV and DVD, fridge, microwave, coffee machine, wood burner, night store heater and electric heaters. Garden furniture. Barbecue. Recycling. Parking for 2 cars. Communal washing machine (£2/wash). Asphalt tennis court for use. We regret no pets. Superbly located on the South coast between the historic fishing villages of Fowey and Charlestown, and 35 minutes by car to the North Coast, Tregrehan is an all season destination of tremendous appeal. Tregrehan House remains home to the Carlyon family since 1565. Tregrehan Garden, next to Kew and Hillier Gardens, protects the greatest diversity of recorded trees in the country. Across a cobbled courtyard, ancient trees tower above the walled garden. Five fully equipped cottages surround the courtyard, each with it's own private garden, some walled, fan outwards. The Estate is surrounded by fields and ancient parkland, yet urban amenities are in easy access (a mile west and east). Entry to Tregrehan Garden is free to guests during opening hours. All season tennis court. Nearby Fowey, historic fishing village and dining mecca. The popular film venue of historic Charlestown with its' tall ships lies to the west. Endless coastal walks. 15 minutes walk to the Eden Project. Pets welcome in Coach House and Gamekeeper's. Arrive to a warm house with lit fires, made beds and milk in the fridge from 3 nights. Tregrehan Estate is part of the Carlyon family heritage which Tom Hudson, a descendant from New Zealand, came to manage over 20 years ago. Tom has a tremendous knowledge of woody plants and has continued the creation of Tregrehan Garden recognised internationally for its collection of trees beginning from Veitch's seed in the mid 19th Century. Jo manages the holiday cottages on the estate. 'We aim to blend the comforts of modern living within the bounds of heritage buildings in the style they deserve'. Tregrehan Estate is an extraordinary place, surprisingly uncommercialised, allowing people who love this environment to enjoy its tranquility. Why this property? Because there is so much to do nearby. Because you return after the day on the beach, in a garden, walking the cliffs, site-seeing, and turn off the A390 to Tregrehan Garden, drive up the dappled Lime Tree Alley of Tregrehan Parkland, and you are really pleased to be home because it is truly a lovely place to be. From east to west on the south coast within 20 minutes lie... the ancient village of Fowey and the Fowey estuary branching to the villages of Lerryn and Lostwithiel with it's antique market. Kayak or canoe on this magic stretch of river with her wooded river banks. Polkerris beach with 'Sam's on the Beach' a popular stone-fired pizza and seafood restaurant, the Rashleigh pub (even more wonderful in winter with the fire burning) and the Polkerris Beach Company who have taught our children to sail and me to windsurf. Par beach, a great dog walking beach all year round. Carlyon Bay - keeping us interested while we wait for its development with 'Sam's in the Bay' bar and restaurant; good swimming. Swashbuckling and fishing at Charlestown Historic Harbour with her historic ships, film ventures and extraordinary harbour. Mevagissey fishing village, famed for her quintessential Cornishness with fishing boats, restaurants and cottage charm. Further inland is The lost garden of Heligan, 25 minutes drive, Lanhydrock House, National Trust, 20 minutes drive, the Eden Project, 20 minutes walk, Tregrehan Garden, on site! To the north within 45 minutes is Newquay (take the direct train line from Par) and Fistral Bay, surfing mecca, and the continuous stretch of beautiful beaches west and east. Walk your socks off on Bodmin Boor or the coastal trail. And a stunning way to visit St Ives is by train. Beauty, quietness, privacy and space, and proximity to many of Cornwall's great attractions. The nearby Polkerris Beach Company (15 minutes drive) hire sailing boats, wind surfers, canoes, skim boards and equipment. They also run an excellent sailing school so book in for your kids. Tregrehan Estate overlooks Carlyon Golf Course to the sea, a mile south. Other golf links within 20 minutes drive include the golf courses at Lanyhdrock, Lostwithiel, Porthpean and St Austell. Notes on accommodation: Payment may be made via our website where alternative dates and season's specials are also noted. October to July we are flexible with dates, so please ask. Changeovers are typically Thursday and Monday. Short breaks from 3 nights. Nestle in for a longer winter break at low season prices. Good quality linen and duvets (feather or non-feather as requested). Cottage fully prepared. Bath towels £6 pp extra. The mews is not suitable for pets. The cottages are decorated with preference for natural fibres. Organic veggie box to order. Recycling. During winter the cottage's wood burners will be lit (wood supplied free from the estate) and they will be warm on arrival. However, if you prefer to get about in just a T-shirt mid-winter, then these cottages aren't your style! Cottages are pink stoned (mined from a local quarry), wooden windows and doors, maintained in traditional character. Outside: The cottages have their own private gardens with garden seating. The Estate includes parkland and fields through which guests are free to wander (please respect the livestock). Public walkways also pass through the Estate. The Eden Project can be reached in 20 minutes walk. Tregrehan Garden is open free to guests when it is open to the public, and at other times as arranged when guests have particular interest. It is a garden of high botanical merit with a fascinating history and we encourage you to visit. An asphalt tennis court is available for the use of guests by arrangement. This was our second stay at Tregrehan, and we loved it as much as the first time. The Mews cottage is lovely and the grounds of the Tregrehan estate are tranquil and beautiful. The Mews was absolutely perfect for us. Our stay was superb. Everyone at Tregrehan was so welcoming and helpful it bowled us over. The environment is just so relaxed and easy and the surroundings very impressive. The actual cottage suited us down to the ground - have to say the weather helped - but the lovely secluded garden was great. When we had a "minor" technical transport problem the sympathetic help was fantastic. Yes, a truly memorable couple of weeks! A great way to get away from other tourists and relax in an authentic and historic garden setting. Accommodation fine - lovely environs. Everyone friendly and helpful. Pleasant and relaxing stay. My 11th visit. The property is comfortable, clean and beautifully equipped. A lovely private garden. We keep returning as the Estate is very beautiful and private and all 4 properties we have been in are of a high standard. Jo and her team do everything to make your holiday a delight. I cannot recommend this wonderful place highly enough. Shall go back next year again. Very enjoyable four nights in charming well equipped mews cottage set in the grounds of Tregrehan House. The property is one of four rented out by the family who live in the house and as guests we were able to visit the extensive woodland as well as the park. The cottage is well placed for visits and not far from the South West Coast path and great walking plus, if the weather is kind, there are plenty of beaches close by too. Tregrehan Garden cottages are open all year round. They are the ideal base for plantsmen and women from February onwards when the Cornish Gardens come into their peak. Tregrehan Garden is a dramatic woodland garden created over the last 200 years by the Carlyon family, forming an exotic green gene bank of known source plants in a temperate rain forest. Within tower some two dozen trees recorded as the biggest of their type in the country. Veteran trees in the 100ha parkland date from the first half of the 17th century. An extensive 128ft glasshouse built in 1844 shelters a fine plant range in the more formal walled garden area. 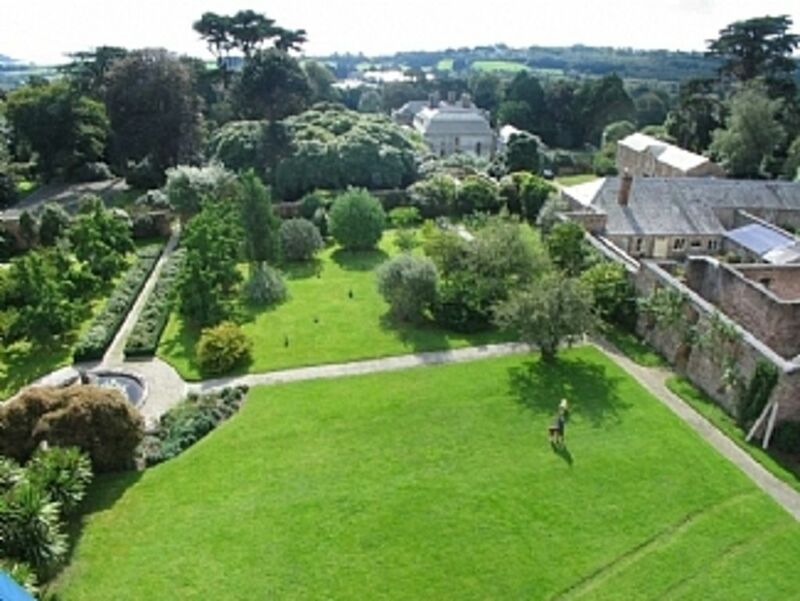 Tregrehan Garden is a garden of recognised merit within a grade II star listed landscape. The garden is free to guests during hours of opening to the public and at other times as arranged when guests have particular interest. Newquay airport 35 minutes by car north-west. Exeter airport 90 minutes by car. Bristol airport 2.5 hours drive. Plymouth ferries one hour eastbound. Local train stations at Par (5 minutes) and St Austell (10 minutes). London Paddington Station 4.5 hours by train. Use of a vehicle (including bicycle) is recommended. The Eden Project 25 minutes walk. Lanhydrock House (National Trust) 20 minutes drive. Fowey Harbour and Village 15 minutes by car. Lost Garden of Heligan 20 minutes drive. Charlestown Village 10 minutes drive. Coastal path 10 minutes walk. Truro city 35 minutes by car. Padstow 35 minutes by car. Since October 2015 WiFi is available in the cottages. Extensive range of banks, shopping, restaurants, leisure activities available locally.